Remember those shoes I mentioned last time? The Alegria Paloma? I'm head-over-heels I lurve with them. I've been visiting the other colors and a pair of their sandals online, in the hopes that another pair will eventually end up at my door. My friends, these may be the best shoes I've ever worn. The first sign? I didn't want to take them off. Normally, no matter what shoes I'm wearing, the first thing I do when I get home is take off my shoes. I leave these on. I've walked to our little downtown area a couple of times in them, and no pain (frequently, I get the burning ball of the foot pain on this walk). I wore them to walk to the train station (and this has been a good test for numerous pairs of shoes) and they passed! And the last true test? Walking around San Francisco. Near the end of the evening, I was getting the tiny bit of pain on my right pinky toe, but not enough that I was terribly bothered. And not enough that I couldn't wear them the next day. They've also passed the "fashion test". 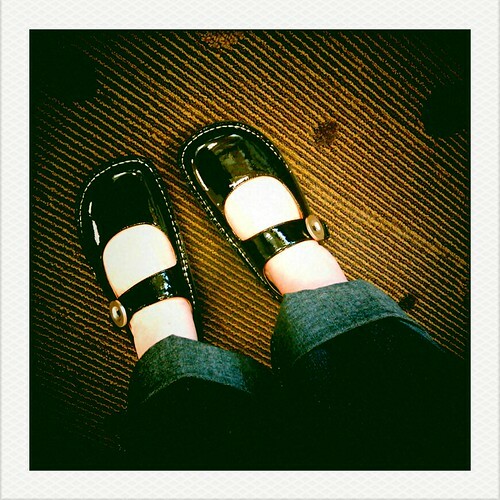 Sometimes, no matter how comfortable a pair of shoes is, if they're not that cute, I simply won't wear them. I've worn these every day except one since I got them (and that day I didn't wear them, I kind of regretted it). I am so excited about these shoes that I've been making other people try them on so they can see how comfy they are. My only complaint, and this is a complaint that I almost never have with shoes, is that they are a little...big. I love that they're wide to accommodate my weird feet, but I feel like they're kind of big all over. Like my feet are sliding around a little too much when I'm walking in them, but it doesn't seem to cause any pain, so I'm not too concerned. I'm pretty sure I ordered the right size, so I think it's just the design on the shoe. I mostly notice it in the morning, but I think as my feet get warmer during the day, this becomes less of an issue. And really, if I had a choice, I think I'd rather have a little extra room, than feel like my feet are being squashed. Have I sold you yet? If you don't believe me, go read this review on Barking Dog Shoes. And then go read the reviews on Online Shoes, and then go buy a pair. Seriously. Your feet will thank you. \n\n\nRemember those shoes I mentioned last time? The Alegria Paloma? I'm head-over-heels I lurve with them. I've been visiting the other colors and a pair of their sandals online, in the hopes that another pair will eventually end up at my door. My friends, these may be the best shoes I've ever worn.\n\nThe first sign? I didn't want to take them off. Normally, no matter what shoes I'm wearing, the first thing I do when I get home is take off my shoes. I leave these on. I've walked to our little downtown area a couple of times in them, and no pain (frequently, I get the burning ball of the foot pain on this walk). I wore them to walk to the train station (and this has been a good test for numerous pairs of shoes) and they passed! And the last true test? Walking around San Francisco. Near the end of the evening, I was getting the tiny bit of pain on my right pinky toe, but not enough that I was terribly bothered. And not enough that I couldn't wear them the next day. They've also passed the \"fashion test\". Sometimes, no matter how comfortable a pair of shoes is, if they're not that cute, I simply won't wear them. I've worn these every day except one since I got them (and that day I didn't wear them, I kind of regretted it). I am so excited about these shoes that I've been making other people try them on so they can see how comfy they are. \n\nMy only complaint, and this is a complaint that I almost never have with shoes, is that they are a little...big. I love that they're wide to accommodate my weird feet, but I feel like they're kind of big all over. Like my feet are sliding around a little too much when I'm walking in them, but it doesn't seem to cause any pain, so I'm not too concerned. I'm pretty sure I ordered the right size, so I think it's just the design on the shoe. I mostly notice it in the morning, but I think as my feet get warmer during the day, this becomes less of an issue. And really, if I had a choice, I think I'd rather have a little extra room, than feel like my feet are being squashed.\n\nHave I sold you yet? If you don't believe me, go read this review on Barking Dog Shoes. And then go read the reviews on Online Shoes, and then go buy a pair. Seriously. Your feet will thank you.